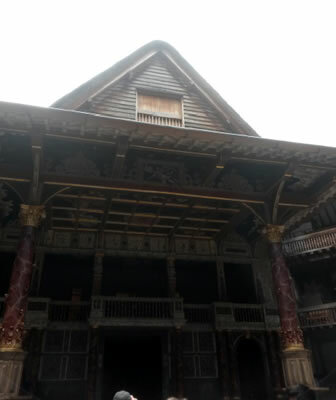 I have long wanted to visit The Globe Theatre and was extremely excited when it became part of our plans on our visit to London. Walking along the river front we spotted the white building with its thatched roof. Walking further along, we came to the front of the theatre. 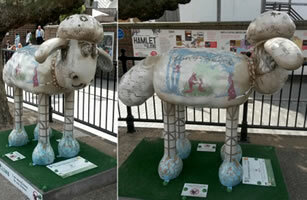 Outside, on the path next to the river, as part of ‘Shaun in the City’ trail, was Shakespeare themed, Shaun the Sheep. This particular one is called ‘Sheep perchance to dream’, a play on a quote from Hamlet. It is painted with quotes and cartoons which represent many of Shakespeare’s plays. 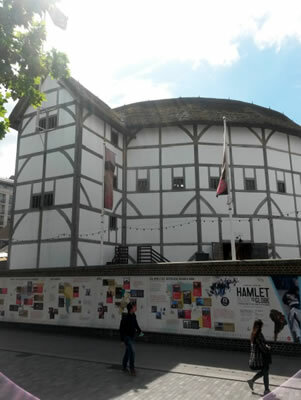 After taking pictures of the Shaun the Sheep and the iconic outside of The Globe Theatre, we approached the visitor entrance. Walking up to the desk to buy tickets we were told the next tour was soon. Tickets printed, we made our way through the entrance area, which was filled with information about the theatre, Shakespeare’s plays and artefacts such as costumes from the performances. 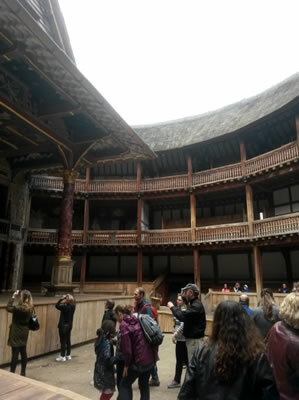 Walking down the stairs, where we were instructed to wait for the tour, we stood and watched people choreographing a sword fighting for a play. A bell was rung and we were called for the tour. Herded into a small area to the side, we were given a short introduction (including the rules of course), and were then taken into a restricted area to begin our tour. 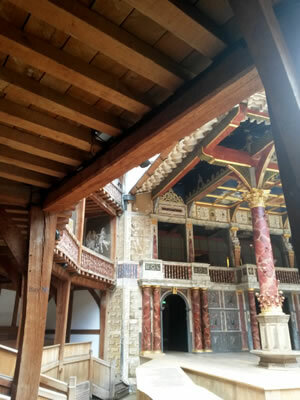 Entering The Globe we sat on the long wooden benches to listen to the guide’s information on the theatre’s history including; the site of the original Globe and how the previous Globes were destroyed (think canon in an enclosed area and fire!). 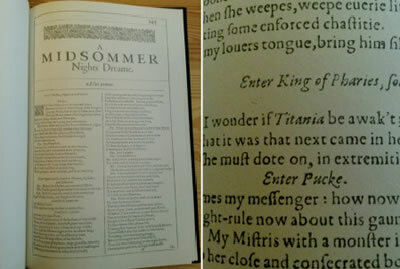 We were also given information about Shakespeare’s plays and how they were originally performed. Clearly a keen fan of Shakespeare’s work the guide was knowledgeable and could quote large passages of script. 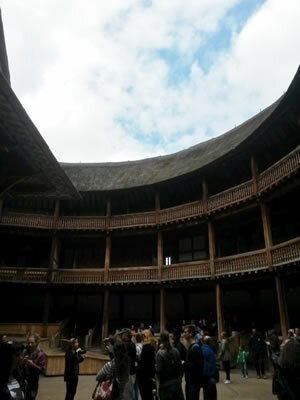 Once the talk was over we were given some free time to take in The Globe itself, and the amazing stage. The stage was set up for Shakespeare’s, ‘As You Like It’. The stage is a delightful view, with its ceiling painted with ‘the Heavens’. 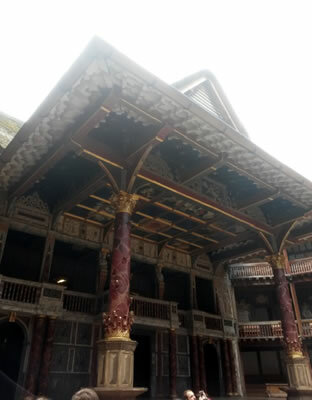 The front pillars had golden and orange leaves added to them as part of the As You Like it set. 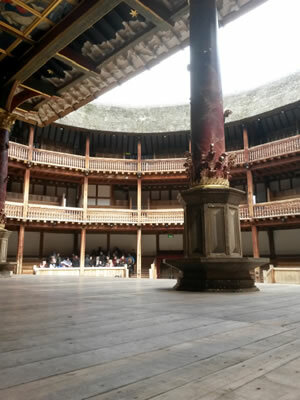 The Globe inside is a beautiful sight to take in, and is great to see even without a play taking place. 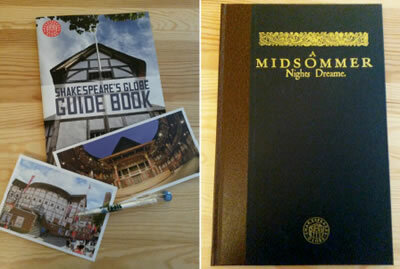 Having finished our tour we made one last stop, the gift shop (of course), where we brought a guide book (to remind us of everything we had learnt from our visit), the usual pens and postcards as well as a beautiful looking copy of A Midsommer Night’s Dream (my favourite Shakespeare play) written in old English.